Have I mentioned how much I enjoy my camera? As a child I had a fun little 110 camera with the tall flip flash for taking photos. I still have some of those photos today. Most are terrible but once in awhile I got a good one. As an adult I got back into photography by using a pocket digital camera, one I got for taking photos of items I was selling on eBay with a camera I bought on eBay. But once I realized I wanted to really learn photography I got a Nikon film camera. As strange as it sounds, I did that on purpose. I could have started with digital but I wanted to slow down and take my time to learn photography the “right” way. I thought of it like learning to drive manual before going to automatic. With Digital I knew I would get impatient and probably not learn as much as I needed and wanted too. Yes film was a pain but it did force me to slow down, look at all 4 corners to make sure nothing was getting in that shouldn’t be in the frame. I made sure to check my horizon line, was it straight? How about the rule of 3rds – was thecomposition what I was looking for? 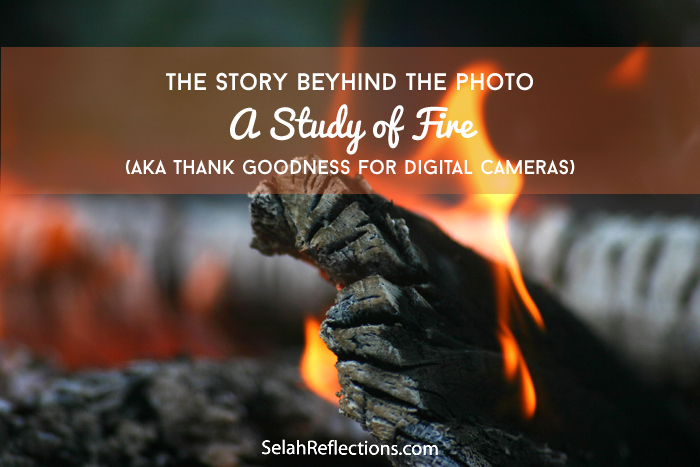 Once I felt more comfortable and had a fairly solid foundation, I switched to a digital SLR camera and fell in love instantly. Now instead of carefully take each shot I could press the button and take multiple shots. I could take 20 shots with different settings and angles and not have to worry about the film loaded in the camera. Freedom! And way less expensive – no more needing to take the film to be developed or the buying of film. I could pick and choose what I wanted to print out. Last month I was at a birthday party out in the country. Surrounded by fenced pastures, hills, blue skies, horses nearby and a pack of black and white dogs milling around all the family and friends. It was so nice! 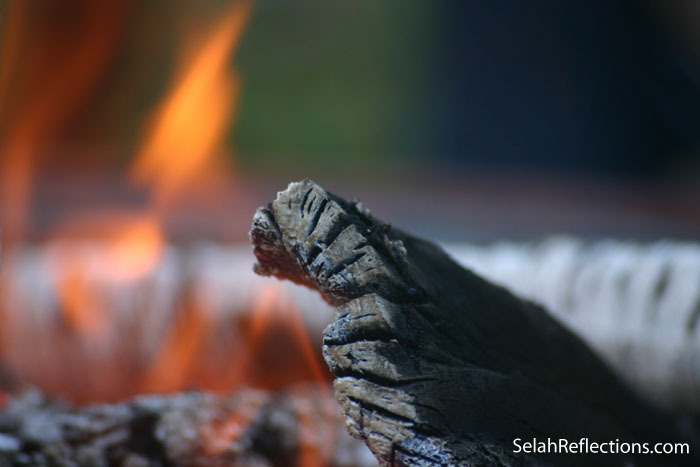 Once the sun started to go down behind the hills and the temperature started to drop, the promised fire was started. It was built up to the point most of us were moving back, away from the heat. As the the light started to fade and the fire burned, I found myself enchanted by the glow of the flames. 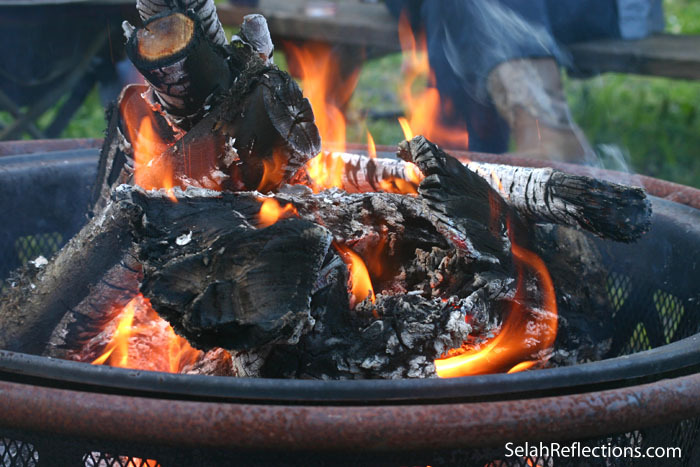 The logs were turning to ashen gray, the bright yellow and orange flames flickering and doing their job, it was beautiful. This is the type of photography I like. A simple subject that you can study from different angles and each photo has a slightly different look and feel. Zooming in and out, shifting left and right, waiting for the fire to burn down a bit or build back up – fire can be utterly fascinating. 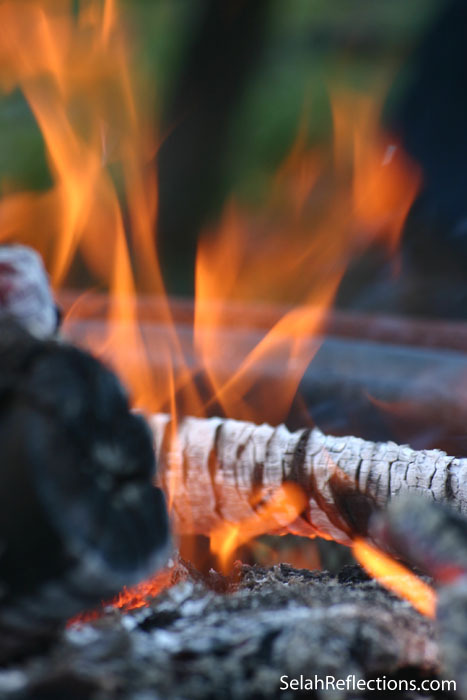 It is a force that can be destructive when out of control and yet under control warms us, heats our homes and is one of the most talked about events of camping! One of the reasons I love photography is the need to stop, slow down and pay attention. With photography, you have to be in the moment, present and paying attention to the details you need to see in order to get the image you are looking for. In all the hobbies I have tried my hand at over the years photography is the one I keep going back to. It’s the one I get the most comments on and the tool I carry with me the most. It is also another reason to get out there and hit the trail, find new places to explore with my Bailey Boy and keep an eye out for details and moments to capture with my camera. Now with my iPhone I take more pictures then ever before, and that feels great. A gorgeous sunrise or sunset while I am running or walking in the morning is so much easier to capture with the phone in my pocket rather than needing to carry my “big” camera around. But many times I realllly wish I had my SLR with me to take advantage of the zoom and get in there and photograph the details I am seeing. Do you have a hobby that captures your attention on a deep level? Do you schedule time to work and develop that hobby on a regular basis? Interesting how each type of device has it’s photography-related advantages and disadvantages. I often accidentally call my phone my “camera”. Yes! I do too. “Let me grab my camera, I mean phone… “.